A finite element model has been developed to predict in vivo micro motion between a modular acetabular cup and liner after cement less total hip arthroplasty. The purpose of this study is to experimentally validate the model. Six LVDT sensors were used to monitor the micromotion of the liner when subjected to loading conditions ranging from 250 N to 5000 N. Deformations at points of interest for both the experiment and FEM were compared. Results of the FEM with different coefficient of friction between the liner and the cup were investigated to correlate with the experimental results. Polyethylene wear particles generated from the acetabular liner of an acetabular cup are a cause of the osteolysis associated with acetabular cup failure. Wear generation comes from the articulation of the femoral head and the liner and from the articulation of the liner and the metal shell. Wear generated by micromotion at the liner metal shell interface, termed backside wear, is potentially more damaging because of the egress of the particles to the cup bone interface through the screw holes and the central fenestration in the metal shell. These particles then create an inflammatory reaction that can produce osteolysis of the bone, leading to degradation of the interface and eventual failure. The etiology of micromotion between the metal shell and polyethylene is multifactorial. Important factors include the contact stress , relative sliding distances , conformity between contacting surfaces and the number of screw holes in the acetabular shell . A rigid locking mechanism is paramount in limiting micromotion at the liner shell interface. Conformity of the liner shell interface and polishing of the metallic shell are new advances to limit fractional wear. The loading of the hip joint is cyclical and occurs during gait. Impact loading of the hip joint can also occur as a result of subluxation and relocation of the metallic ball in the polyethylene cup. Little work has been done on the effect of physiologic loads on micromotion at the cup liner interface. The load patterns are particularly complex during subluxation relocation because the initial contact at relocation may be eccentric creating a moment. The cylical pattern of loading associated with level gait, stair climbing and the impact from eccentric subluxation and relocation are virtually impossible to reproduce physically in the laboratory. To this end a finite element model has been created to investigate micromotion of the metal shell liner interface. The purpose of this experiment is to validate this model. The validation of the model quantifies micromotion of a loaded acetabular cup liner assembly with linear variable differential transducer (LVDT) sensors. Seven commercially available UHMWPE liners, 28 mm inner diameter and 54 mm outer diameter, were used. The experiment set-up is represented in Figure 1. Experiment set-up. Orientation of the acetabular components (acetabular shell, liner and femoral head) with respect to applied load. Two acetabular shells (66 mm outer diameter) were used during all the experiments. The first had only a polar fenestration and the second had polar fenestration and three screw holes. A sensor positioning plate containing six calibrated LVDT sensors (AC-DC LVDTS 332, TRANS-TEK Inc, Ellington, CT) was rigidly attached to the jig. The LVDT sensors detect linear micromotion in the x, y and z direction. The metal tip of each LVDT sensor was set to zero position when it came in contact with the liner before any loading conditions were applied. Care was taken to locate the sensors' tips away from the liners' anti-rotation tabs. Three of the sensors contacted the liner perpendicularly to the outer flat surface, while the other three contacted the liner perpendicularly from the side (Figure 2). The displacements measured using the six LVDT sensors correspond to the local deformation of the polyethylene liner at the points of contact. Modular Acetabular components set-up and LVDT sensors' positioning. The jig sensor assembly was positioned in an INSTRON machine (Model 5579, Instron Corp., Canton, MA) for loading. Load was applied to the acetabular components through a 28 mm, commercially available femoral head attached to the movable crosshead of the INSTRON machine. The femoral head was positioned in the acetabular liner and adjusted until a conforming contact was achieved without applying significant load. The readings on the sensors were still showing zero displacements. This served as the starting point for experimental measurements of load and micromotion. The loading characteristics of each trial were set with the INSTRON computer controller (Merlin 5500 Series). The loading characteristics applied to the liner (including number of cycles, speed, and maximum load) were specified. 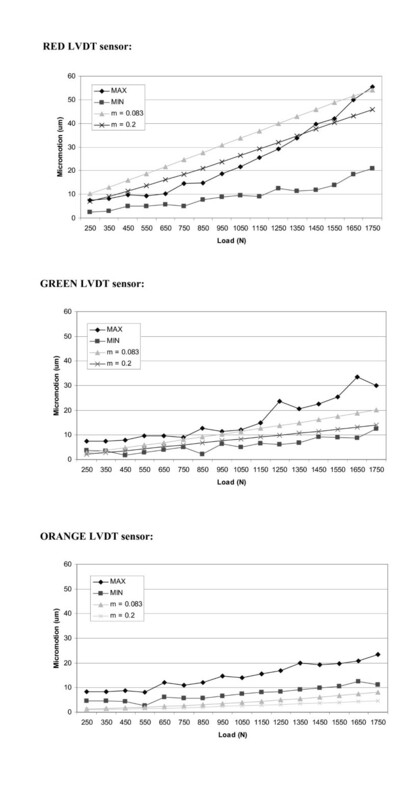 Each specimen (liner) was subjected to the loading profiles described in Table 1. Loading profile applied to each liner specimen. In each loading case the load range applied goes from 0 N to the maximum load specified for each loading case. The LVDT sensors were connected through a Data Acquisition Card (DAQCard-A1-16E-4, National Instruments, Austin, TX) to a laptop computer. Using data analysis software (Lab-View, National Instruments, Austin, TX), a program was developed to transform the signals from the LVDT sensors into micromotion displacement values. 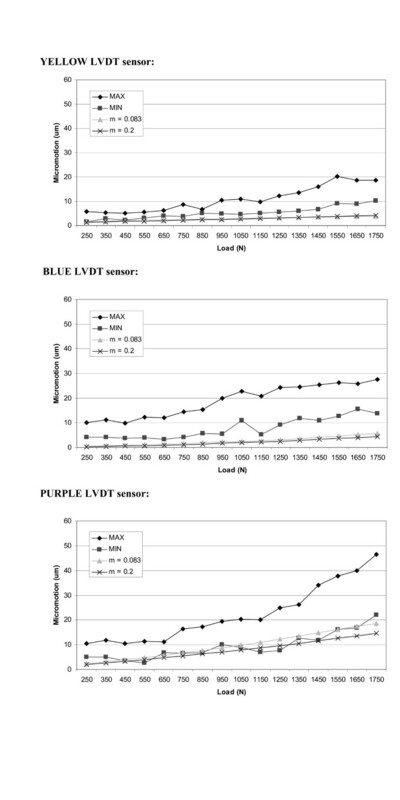 The micromotion values from the LVDT sensors were synchronized with the loads applied with the INSTRON machine. The FEM was then used to generate values for micromotion at the points of attachment of the LVDT on the polyethylene liner. The comparison of results from the experimental and computational models allowed us to validate the finite element model of the modular acetabular component. Three-dimensional computer models of the modular prosthetic components (femoral head, acetabular liner and acetabular shell) were developed using Pro/Engineer 2000i2 (Parametric Technologies Inc., Needham, MA). Component dimensions used in the models were based on precise measurements taken from commercially available products (DePuy, Inc., Warsaw, IN) using hand instruments. The model was created with a polar fenestration. The same consideration was made to model the liner. Geometrical details without structural significance were omitted in order to import CAD models to the standard ANSYS format (IGES). All 3-D models were converted to IGES format (No-defeaturing option). 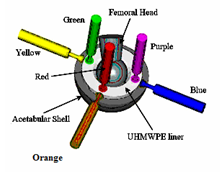 A three dimensional 3595 elements FE model (Figure 3) of the femoral head, liner, and acetabular shell was developed based on the CAD geometry previously created using ANSYS/LS-DYNA. The diameter of the articulating surface femoral head/liner measured 28 mm while the liner backside diameter measured 54 mm. A 12 mm diameter polar fenestration was placed in the metal acetabular shell which corresponds to the central insertion hole. The acetabular shell was positioned with 45° inclination and 25° anteversion . 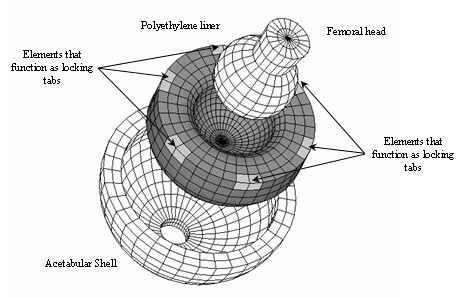 Finite Element Model of the acetabular shell, liner and femoral head. 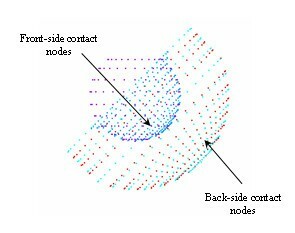 The liner locking mechanism was simulated constraining all degrees of freedom of the nodes located at the same positions as locking tabs of the real-life liner. The Finite Element mesh of the acetabular shell, liner and femoral head consisted of eight-node hexahedron solid elements (Table 2). A polar mesh design was selected to avoid the nodal penetration problem (Figure 4). The mesh pattern was kept the same in all the contacting areas (outer surface of the femoral head-liner front side and liner back-side and acetabular shell) so that, the nodes placed in the contacting surfaces do not interfere with the target area. A cross section of the liner, acetabular shell and femoral head were first meshed due to axial symmetric conditions of the model. Planar elements were then used having perfect control of the shape of the elements. The planar elements were revolved with a specific angle creating a polar mesh design. The angle of revolution was chosen to avoid singularities that can occur when hexahedron elements are converted to tetrahedron elements . Comparison between the material properties Finite Element model and real-life components material properties. Contacting areas (Acetabular Shell/liner and Liner/femoral head) involved in the Finite Element Model. A linear contact between implant components was modeled using an automatic surface-to-surface contact (ASTS). The acetabular shell was fully constrained, assuming a rigid union between the acetabular shell and the acetabulum. The femoral head was constrained with respect to the rotational degrees of freedom. Perfect conformity between femoral head and liner as well as between liner and acetabular shell was assumed. Anti-rotation features such as the equatorial locking tabs provide the greatest restraint to keep the liner in the proper position within the shell . When load is applied to a modular acetabular component with locking constraints, the liner locking tabs share the greater part of the applied load. In order to simulate the six locking equatorial tabs of the liner, a total of twelve nodes of the liner FE model were fully constrained (Figure 3). Coordinate system used as a reference for the loads in the FE model. The CS is shown with respect to the acetabular shell inclination angle. Published reports of the friction coefficient between the metal and polyethylene ranged from μ = (0.083 to 0.2). [,15a] The finite element model was run with friction coefficient values that varied between the given range and results of the FE with the minimum and maximum coefficient of friction were used to compare the analytical solution with the experimental data. Further discussion is provided in the section below. Figure 6 shows the micromotion measured for each of the seven liner specimens studied. Each graph corresponds to one liner specimen. The six curves in each graph represent the maximum micromotion achieved for each of the six LVDT sensors. The maximum physiological loads experienced in hip are within a range of 1700 to 2200 N. As described in this study, the maximum load applied to each liner specimen during the validation experiment was 10,000 N, which is beyond the attainable force between the acetabular liner and the femoral head in the body. The objective of carrying the experiment beyond 2200 N is to investigate how the liner responds to higher loads and whether there is drastic change in deformation (plastic deformation) where certain peak forces are achieved. Maximum micromotions achieved for each of the seven liner specimen analyzed. 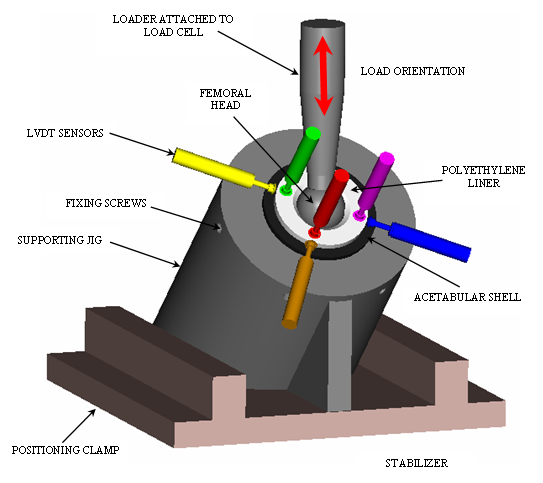 As described previously, a loading profile, similar to the one in the experiment, was used in the FE model. According to the experimental set-up, the micromotion results corresponded to six specific points, where the sensors' tips came in contact with the liner. The corresponding points were identified in the FE model. Because the LVDT sensors only measure displacements along their longitudinal axes, those directions were identified with simple trigonometric calculation in the FE model through superposition of the experimental axes. The micromotions (displacements) were computed in the FE model of the nodes positioned at the reference points, along the identified direction. Figures 7 and 8 indicate the maximum and minimum deformation (micromotion) values, for all the seven liners analyzed, where each sensor was compared to the result obtained with the finite element model. The FE model results are shown for two values of coefficient of friction (μ = 0.2 and μ = 0.083). As expected, the sensors positioned perpendicular to the outer flat surface of the liner recorded the most significant micromotion. This is attributed to the fact that this is the direction along which the liner is less constrained. The three sensors positioned perpendicularly to the side of the liner recorded very little micromotion. This micromotion was produced because of local deformations from the bulging effect of the polyethylene when subjected to compressive loads. Maximum and minimum micromotions values, among all the specimens analyzed, recorded for each sensor. Comparison with the results obtained with the FE model considering two different friction coefficients. In all the experimental data collected from the seven specimens the result obtained in the FE model, for both friction coefficients, are between the maximum and minimum values obtained in the experiment. 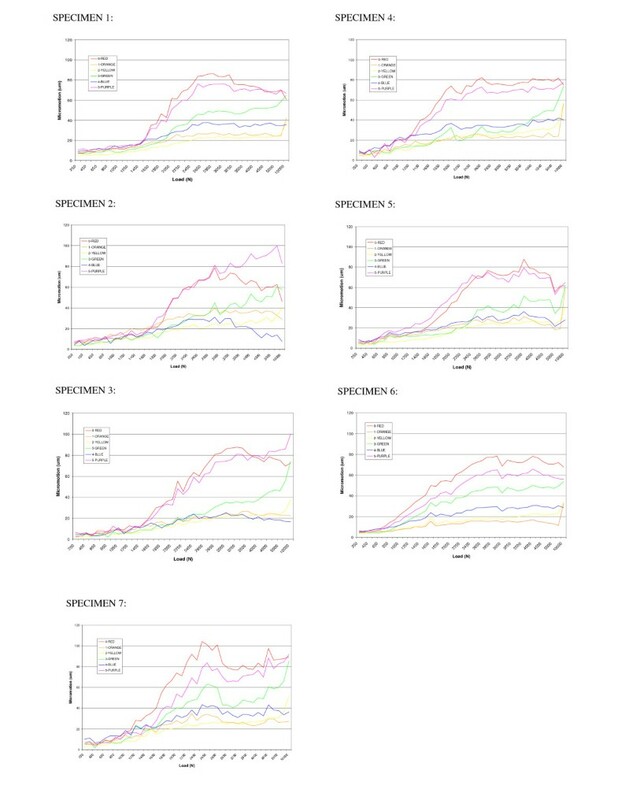 This is a first check on the validity of the model and its analytical prediction. Considering the average values for the experiment results (based on the maximum and minimum micromotion values collected for each load), the FE model with the lowest value of showed a closer fit and depicts a more realistic response. When modeling conformity it is important to note that the actual liner and cup do not possess such a characteristic, in fact there are gaps due to the geometrical difference of the two components. These clearances will make the friction between the liner and the cup less pronounced; hence a relaxed value in the FE model is more appropriate. Our validation supports such a scenario. This study highlights two main points. One the experiment provides an insight into the stability and micromotion of the liner/cup interface. Indeed it provides the means by which we can quantify the micromotion/load interface in relation to the liner and locking mechanism designs. Second these experiments along with the FE model becomes an important tool in identification of weak spots and areas where both stress and wear can be identified. The objective of this research while focused on several specimens the design of the locking mechanism of the liner with respect to the cup is the same. In future studies we intend to perform a much larger study where different locking mechanisms designs can be compared under different loads and moments. The current investigation has prompted us to suggest areas where we can improve both the FE model as well as learning further how the liners designs affect the results of micromotion and wear. These include: the conformity of the contact surfaces, geometry and tolerances of the CAD model, representation of the liner locking mechanism and material properties. Conformity allows distribution of load more along the equatorial surface of the load and might increase back wear when the material expand and slide along the surface at he interface of the cup/liner. The conformity might also play a significant role in load transfer to the cup and hence changing the micromotion condition at the cup/bone interface. The cup bone interface is a subject of another investigation currently being conducted at our Laboratory. The results of the validation show that the correlation of the micromotion data given by the FE model and the experimental data depend upon the position of each sensor. The sensors positioned along the flat surface of the liner recorded values that closely matched the model. Among those three sensors, the one positioned further to the axis of application of the load registered the best results. The other two sensors positioned in the flat surface of the liner (red and purple) matched closely the results only in the load ranges between 1500 N and 1750 N. Furthermore, the results obtained for the three sensors positioned perpendicularly to the flat surface of the liner are in the same range of the values obtained from the experiment. Therefore, it is clear that the sensors subjected to higher bulging/deformation showed a slight deviation from those in the FE model. These variations might be a consequence of the assumptions made in selection of polyethylene material. A more precise material model would certainly describe the bulging effects more accurately. For example a more accurate description of the material used in the model would be a piecewise linear isotropic plasticity material . This planned in our future research development. Another important assumption made in the model is the treatment of the liner's locking tabs. As describe earlier, the locking tabs were simulated constraining all the degrees of freedom of the nodes placed in the same position as the actual locking tabs. This assumption states that the nodes simulating the locking tabs were completely fixed (constrained) to the acetabular shell and may induce high stress concentration areas. In reality those tabs are designed to have significant gap around them when the liner is fully seated. Surely this factor might permit a more even stress distribution in the elements surrounding the constrained nodes of the locking tabs. This might result in a smaller peak stress values at the nodes. The last hypothesis considered in the present study is concerned with the conformity of the contact areas. Perfect conformity was assumed between liner's backside and acetabular shell inner-surface and between liner's front-side surface and femoral head. In the actual acetabular components certain gaps are allowed between contacting surfaces for both design and manufacturer tolerances. The stress distributions and micromotions achieved in the liner might be different if those gaps were considered and the results obtained might be closer than the one obtained in this study. The objective of the present study was to validate a FE model of modular acetabular prosthesis with data collected experimentally. 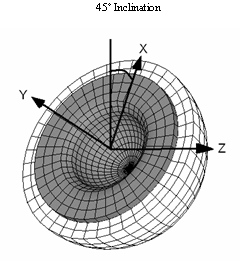 The model is preliminary and gives a reasonable approximation of values of micromotion obtained experimentally. Further work is needed to enhance the model development and improve the accuracy of the model. Unit of Time equal to 60 seconds. Unit of Length equal to one 10-3 meters. Todd Render and Paul Lewis, DePuy (Johnson and Johnson), Warsaw, Indiana. This experiment was supported in part from unrestricted research funds from DePuy. Jeff Goldstein. University of Illinois at Chicago. Lab Assistant.